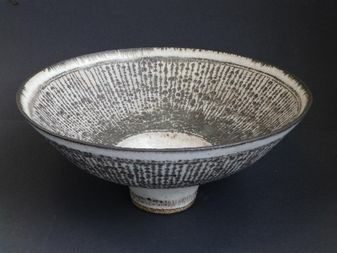 Michael Bowman's September 2017 auction at Chudleigh will be remembered for the star part played by a 10" diameter stoneware bowl by the renowned ceramicist, Dame Lucie Rie. Austrian born Lucie Rie (1902-1995), fled Austria prior to World War II, to settle in London. The years that followed, saw her build a reputation as one of our leading ceramic artists, counting Bernard Leach, as one of her circle of friends. 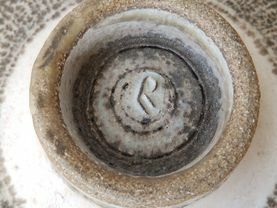 The bowl on offer at Chudleigh, emerged from a local deceased estate in Totnes and displayed a version of the 'knitted' form of decoration employed by Rie in many of her Japanese-inspired creations. An estimate of £6,000-9,000 attracted six telephone bidders as well as a substantial commission bid from Japan. The eventual buyers on the telephone, were UK collectors, who stretched themselves to a final bid of £23,000 for their prize! Although Lucie Rie's work has fetched extremely high prices in recent years, the result achieved in Devon would appear to be almost double that of similar bowls sold at auctions in the USA and South Africa..